This article is inspired by ART21’s forthcoming event, “Creative Chemistries: Radical Practices for Art + Education”—an experimental platform that brings artists and educators together to explore innovative practices for both fields. El Anatsui. Dzesi II, 2006. Aluminum and copper wire; 117 x 195 inches. Collection of the Akron Art Museum, Akron, Ohio. Courtesy the artist and Jack Shainman Gallery, New York. 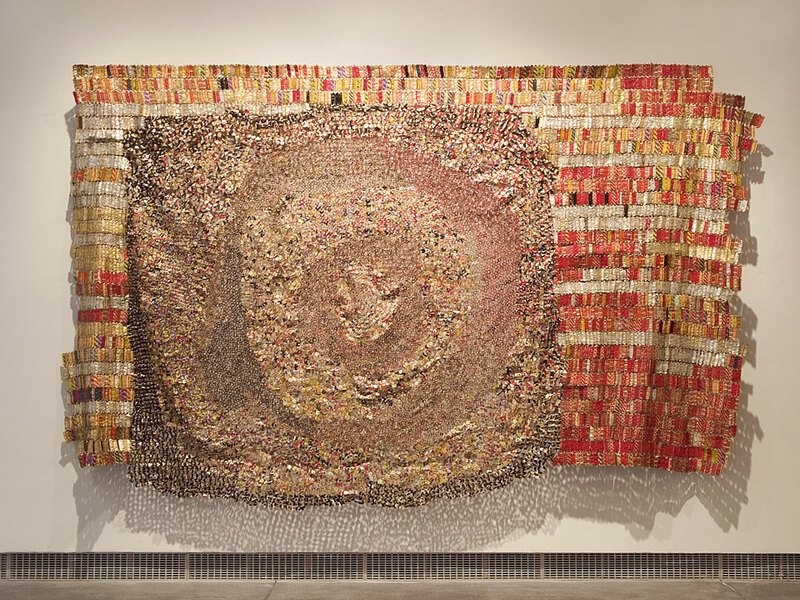 © El Anatsui. Chemistry—loosely defined here as the productive co-mingling of elements, such as ideas, perspectives, and people—is essential not only to science but also to creativity and the act of producing knowledge and culture. Chemistry can serve both science and art but must include the unstable elements of chance and risk. When productive chemistry occurs, it could result in an explosion or an entirely new state or set of properties or behaviors. Scientists approach chemistry as a way to investigate and play with matter—to push it to new extremes and possibilities. As a metaphor at human scale, chemistry suggests more ephemeral, emotional, and subjective states: the feelings of affinity, repulsion, love, anger as well as the potential to form connections and new circumstances with others, to bond or be repelled, to generate friction or frisson. So how might the seemingly distinct elements of art and education generate a productive chemical reaction? What forms of alchemical mingling and morphing are possible? Both art and education are disciplines that provoke thinking and learning, alternative ideas, and critical understandings, but their methods and motivations often diverge radically. While each discipline hews to its own hierarchies and rules, both share a relationship to specific idealisms and ideologies. A complicated mixture of democracy and capitalism informs the field of education in the United States. Students are future citizens as well as future workers, and all deserve equal opportunities, but most lack equal access. Education should teach students how to think for themselves, but too often students are held accountable for what someone else told them to think or what someone else says is important to know. In art, democracy and capitalism are also useful references, and artists must find a balance between serving the market and the public. Within these terms, the roles and functions of educators and artists have seemingly diverged. Teachers have become implicated in a larger system of checks and balances that rewards one-size-fits-all standardization and discourages artistry and risk taking. While artists and educators are both vilified or infantilized in the popular imagination, only artists are rewarded for their audacity and ability to subvert, invent, or engage their audiences in unexpected ways. So what does this have to do with chemistry? Both art and education—and their practitioners—stand to benefit from each other. What teachers do well is break down ideas and concepts into smaller parts that students can understand. They work with facts and figures, histories and stories, and themes and questions in pursuit of the bigger picture. What artists do well is build on ideas and concepts that viewers can engage with in multiple ways and from multiple vantage points. They too work with stories and themes and ask big questions of themselves and their audience. But these two groups of people—artists and educators—are rarely in the same room for anything beyond lectures and presentations. Discussions about the functions and possibilities for art and education are indeed happening, but they’re happening in separate spaces and within the constraints of very different paradigms. How might the exchange between contemporary artists and educators inspire visionary educational practices, reframe the work of artists, and further the promise of both fields? How might the questions that artists and educators keep asking themselves become questions for both groups in order to open up new ideas and possibilities? How can we support these forms of cross-pollination to further strengthen the goals of both art and education? Mark Dion has said, “Understanding the interrelatedness of things is interesting to me, and I think that it’s something we often miss in our culture.”1 Artists frequently look to other disciplines and disciplinary experts to make conceptual connections and forge new ideas. The last decade has seen a pronounced interest in education specifically, and many artists have embraced educational theories, methods, and forms as part of their work. The recently coined “educational turn” and socially engaged art practice proactively seek to involve and innovate pedagogy as an aspect of art in order to work with the public or with specific communities of people, including youth. But the field of education remains rather cloistered. The term education itself still conjures up an image of passive students at desks in rows rather than inventive exploration. And education’s presumed advocates (such as administrators, bureaucrats, and policy makers) are not calling for creative problem solving or border stretching to look for new ideas or inspiration within defunct systems. The conceptual borders seem closed. How can we open up this one-way channel between art and education? Let’s imbue education with the same sense of purpose, reinvention, and alchemy. It is only through the possibility of creative chemistries and real learning between artists and educators that we might start to turn the most mundane aspects of education into extraordinary gold. “Creative Chemistries” begins with a screening and discussion on Friday, February 20, 2015, leading to a full day of exchanges, dialogues, and experiments on Saturday, February 21, 2015. The event is sold out. 1. Mark Dion, 2008. “Mark Dion: Methodology” ART21 “Exclusive” film. Accessed online (http://www.art21.org/videos/short-mark-dion-methodology) on January 25, 2015. 2. Yinka Shonibare, 2010. “Yinka Shonibare MBE: Nelson in a Bottle” ART21 “Exclusive” film. Accessed online (http://www.art21.org/videos/short-yinka-shonibare-mbe-nelsons-ship-in-a-bottle) on January 25, 2015.